Cinderella Castle in Dream Lights. Next month will begin my 7th year of blogging. While my frequency over the last couple of years has lessened, I will continue to post photos through 2015. This entry was posted in Weekly View and tagged 28-300mm, christmas, cinderella castle, dream lights, florida, holiday, magic kingdom, night photography, nikon D700, orlando, tripod, vr, walt disney world. Bookmark the permalink. Merry Christmas to you too! The castle looks lovely! 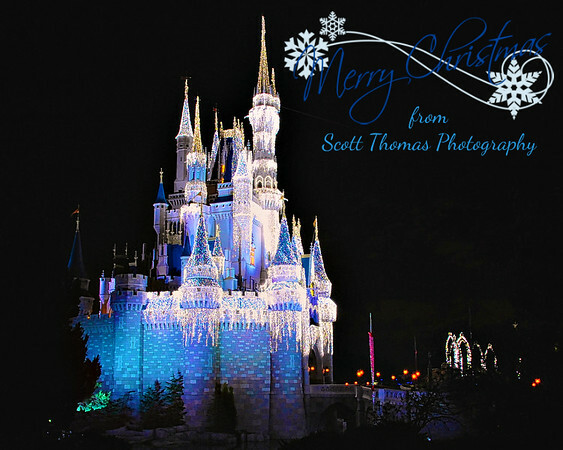 Merry Christmas to you and your family Scott, looking forward to seeing more photos in 2015. Thank you, Nye! I look forward to more, too. LOL Need to get outside a hockey rink more often this year. Merry Christmas to you and your family, thank you for many interesting photos and good advice throughout the year. Thanks, Birgitte! Hope you had a lovely Christmas with your family, too!